Have you ever asked yourself, 'why am I always sneezy in the morning?' and never really got the answer for it? I took some time to do some research on finding the cause of it, and here are the several possible reasons why you have to face these seasonal allergy symptoms. There's this thing called pollen counts which are generally higher in the morning compared to during the daytime. These pollens can be common causes at home which includes dust mites, pets or even from flowering plants. So the chances of exposure are relatively common, but if ignored, your sinus worries may get worst! The real question now is, 'How do I solve my sinus problems?'. 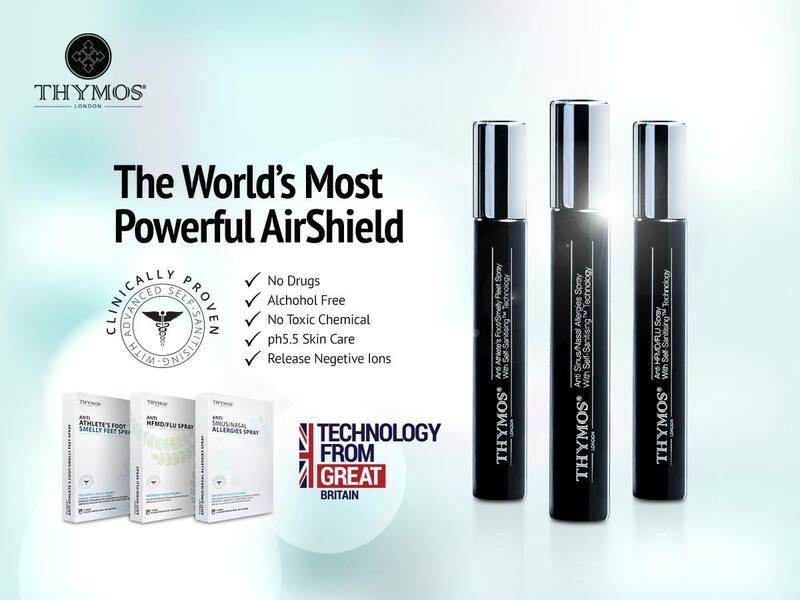 The worlds most powerful air shield, Thymos London. Have you heard about CFU before? If you haven't, CFU in microbiology is a colony forming unit (also known as CFU), to estimate the number of bacteria of fungal cells. Believe it or not, no matter if you're indoors or outdoors, the potential of CFU's can be found almost anywhere. 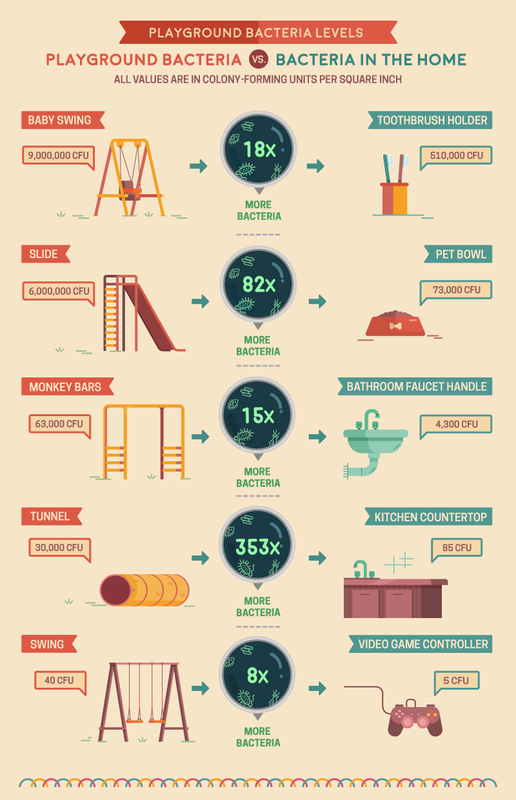 Based on the infographic above, you would see the values of CFU at a playground in comparison to values of CFU at home. Just looking at it made me felt a little insecure with my surroundings now, and would some of it be the main cause of my morning sinus flu? Thymos is known as the worlds most advanced sanitize that works relentlessly around the clock to protect any treated surface of your choice, from the most harmful bacteria and viruses, including the smallest virus ever found in this century. With a catchy catch phase of '10 years sinus, relief in 3 days', the brand has built a lot of trust with its consumers up to today. One of their achievements would be that THYMOS has clinically proven to kill 99.99% or MERS-CoV, H1N1, EnteroVirus, MDR Bacteria and other pathogens making its reliable mark to help those who worry about surrounding flu diseases. And in this post, I'll be sharing with you my review of the Thymos London. The Self-Sanitising Technology, the spray claims to deliver 12 hours of protection, underlining its mission to help your lifestyle be allergy-free with maximum comfort to last the entire day. The actual product comes in a compact 10ml spray bottle, good enough for about 170 sprays in total. I was expecting it to have an alcoholic fragrance but surprisingly it doesn't have any scent, rest assured not giving me an uneasy feeling about accidentally inhaling it. YAY! Since getting the Sinus/Nasal Allergies Spray Thymos, there's surprisingly a variety of ways to use it. Check out below to find out how to use this. Using this is as easy as ABC. Since its already conveniently in a spray bottle, all you need is one spray to effectively reduce pathogenically induced allergies and you're good to go! 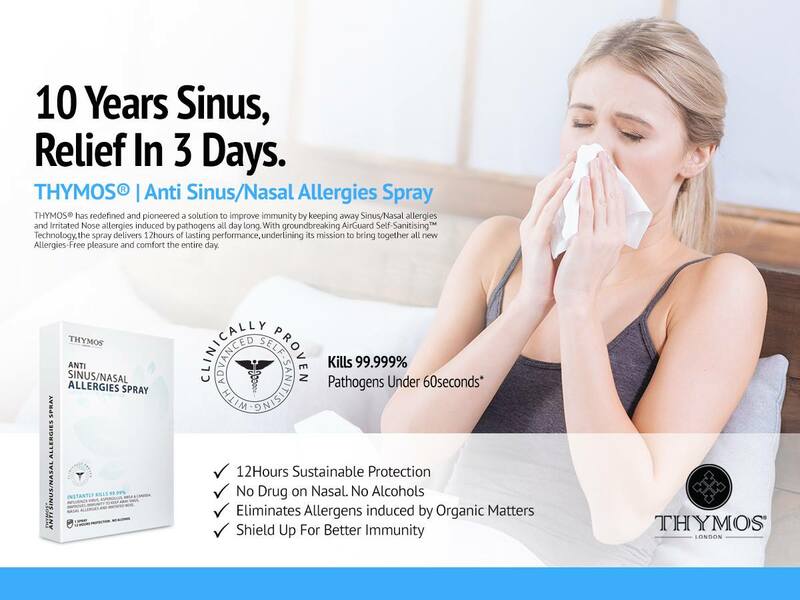 If your next question is, 'where do I spray my Thymos Anti Sinus/Nasal Allergies Spray? ', then let me help you on that. Like the image about, I've shown you 3 examples of how you can use this. You can just spray it on your shirt and wear it like a perfume to boost your antibodies, you can spray in on your pillow or bolster to reduce sinus allergies OR you can also just spray it in the air for instant relief from irritation.